Who's FANIE -- As you browse the FANIE International website, chances are you are shopping for a skin care product that really works. Like everyone else, you are looking for the "perfect fix", the magic bullet, or instant cure. There are too many "breakthrough" technologies for you to navigate. Well, you are not alone. Please read the History & Philosophy behind the FANIE line of products. Ask FANIE -- Do you have a special beauty problem? Our staff of licensed estheticians and beauty consultants are available to help you look and feel your best. PLEASE LET US KNOW. FANIE (Fan-nay) - From the people who care... with amazing head-to-toe holistic professional and home care health and beauty systems, that is effective and unique using NO animal fats, animal oils or animal parts and NO sugar, alcohol, synthetics, silicone or caustic ingredients.. Successfully used by men and women of all ages and skin color worldwide in excess of 58 years, FANIE products provide realistic solutions to skin, hair and nail care naturally. Discover for yourself realistic results inside every jar of FANIE pure botanical products... "No Promises, Just Results." 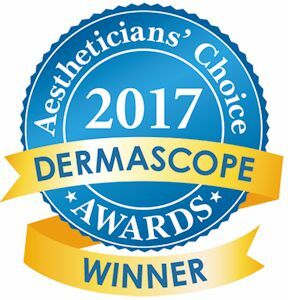 Dermascope's Aestheticians' Choice Award for 2018! Third Year in a Row!!! SPECIAL - 15% Discount For Skin Type "Product Groups"
All product groups already include a 15% discount over buying the products individually. Salon, Spas, Clinic and owners besides therapist and beauty professionals can order products for resale and professional strength products directly here once logged in and validated as a professional. You can login or go here for more details. For professional access to this site you will need to create a user account by registering on this site and follow-up by faxing or e-mailing proof of your business and/or professional license. Once confirmed you will have professional access to this site. FANIE Affiliate Program is Here! We are looking for a select few active web and social media stand-outs to want to promote FANIE and our products. This is an awesome way to make money. Selling the product that sells itself! How it works. You must have a web site or publicly available social media home page. From there you will be able to receive commission on business from your customers who follow a custom link you provide to place FANIE orders. Then orders will be shipped directly from FANIE - no inventory to stock. Your affiliate account will be credited. Further info can be obtained by emailing info@fanie.com. What is proper skin care? Basic skin care starts with proper cleansing. Most cleansers will rid the skin of dirt and oils. This is done by literally dissolving grime and dirt for release into an easy to remove solution by rinsing. Soap is a very effective, easily available, a convenient cleanser that seems to perform these functions. Composed of fatty acids (usually animal fat but sometimes vegetable fats or oils) and lye, the soap molecule is double-ended; one end likes grease and grime and the other likes water. The grease-loving end attaches itself to dirt on the skin and the water-loving end then puts the grease into solution to be rinsed away -- at least, that is the way it is supposed to work. It was many years ago the first time I heard the word "Hyaluronic Acid" from my late husband, Dr. Clyde Johnson who was involved with his partner, Frank Homer pharmacist and owner of the O C drug store by Saint Joseph Hospital in Orange California. It was a miraculous chemical formulated to help burn patients. Why bags and dark areas under eyes? It could mean a number of reasons that cause bags and dark areas under and around the eyes, besides not enough sleep. The darkness can also be generic in families which I have seen mostly in Middle Eastern people besides other nationalities, especially with olive type skin. Darkness under eyes may be an internal medical condition such as from kidney failure etc.only medical doctors know. You asked, we listened, due to most people not having the time to mix and lay down for 45 minites with a enzyme masque treatment - we went back to the drawing board and formulated two new products for the FANIE line... A liquid tightening and toning skin masque and named it A.S.A.P. and the name fits. We also formulated our Sweet Apple Foaming Botanical skin Cleanser as the sister product. These products made their debut in the Emmy and Oscar Awards gifting bags and they work wonders on all types of skin. The Sweet Apple Foaming Botanical Cleanser is a delicate cleanser that can be used on the face and body. As with all FANIE cleansers, this deep pore foaming cleanser leaves no residue after rinsing. This skin cleanser has a sweet apples scent that is not overpowering and comes in a foaming dispenser, also wonderful for shaving leaving no razor burns. The A.S.A.P. Liquid Skin Tightening and Toning is our re-introduction of the liquid masque from so many years ago. This product can be used by men and women of all ages and skin color and especially for people on the go with no time for personal skin care.. Squeeze in a complete masque in 20 minutes or less. Already in liquid form, no measuring or mixing. Simply cleanse the skin with our unique cleanser, then apply the liquid masque with your finger-tips, wait 15 minutes, then thoroughly rinse off with warm water with a soft cloth or in the shower. Youthful glowing healthy skin is apparent from the first use.